The regions of North Nottinghamshire, Lincolnshire and South Yorkshire all come together during November to commemorate the Mayflower Pilgrims, a number of whom originated from Bassetlaw. The Mayflower Pilgrims’ Festival starts on Thursday 15th November with a Thanksgiving Dinner in Retford, followed by commemorative events in Worksop, Retford, Babworth, Scrooby, Austerfield, Bawtry and Gainsborough and ends on Sunday 25th with a Pilgrims Fun Run! Towns and villages in North Nottinghamshire, South Yorkshire and Lincolnshire all played a significant part in the true story of the Mayflower Pilgrims, those devoutly religious 'Separatists' who wanted to separate themselves from the Church of England in order to be free to follow their own religion. The only way they could follow their strong beliefs which were totally against the law of the Church of England, meant leaving England altogether, leaving behind everyone and everything they knew. They first settled in Holland and then in 1620 sailed to America, settling in Plymouth, Massachusetts. Some of the most well-known Mayflower Pilgrims came from Bassetlaw and surrounding regions and now, some four centuries later, we hold annual commemorations, which will culminate in 2020 in the 400th anniversary of the Mayflower Pilgrims. 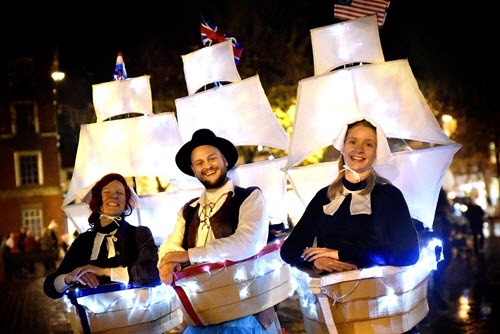 A series of events are taking place in Retford and surrounding villages and towns during this November's Mayflower Pilgrims' Festival. Thursday 15th - Thanksgiving Day Dinner at Spencer’s on the Square, Retford. Friday 23rd - Music at the Priory. Music of the streets from the time of the Pilgrims from the Doncaster Waites. Saturday 24th, Sunday 25th November + Saturday 1, Sunday 2nd December - Star Festival at Grove St. Methodist Church, Retford.